What exactly is a re-manufactured heater? During the heater season, a small amount of heaters are returned within our 30 day return period. We thoroughly inspect and re-manufacture these heaters to like-NEW specifications and test them extensively to ensure each and every unit is properly functioning. We then make them available to you at a discounted price. Our re-manufactured heaters function and perform like new, and are backed by a one year warranty. With over 25 mechanical updates, our Breathe Easy Edition heater/air purifier is quieter, smarter, and more efficient than previous editions and sets a new standard of quality and performance in the portable infrared heating industry. This Breathe-Easy heater also features a 4 stage air-purifier (5th stage carbon filter optional), that operates along with the heater. NOTE: The air purification component in this model does not run independent of the heating component. The air purifier runs only when the heating function is on. The air purification component can also be turned off if desired. 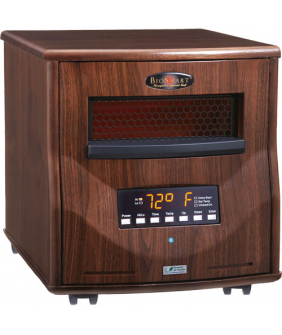 The Breathe Easy Edition has many features not found in any other heater on the market! BIOSMART TECHNOLOGIES (BioSmart) warrants this re-manufactured product, to the original purchaser or gift recipient, to be free from defects in workmanship and materials under normal use and service per the following terms and conditions. Quartz tubes – 1 yr. Fan Motor – 1 yr.
High Limit Switch – 1 yr. Fan Switch – 1 yr.
BioSmart further warrants the infrared heating elements and fan motors, to be free from defects in workmanship and materials under normal use and service for a period of One (1) year from the date of purchase. During this period BioSmart shall supply at no cost, excluding shipping, to the original purchaser, replacement elements or fans as required to maintain product in good working order. Service labor: During the one (1) warranty period BioSmart shall provide free in-house repair service. At customer’s discretion, customer may return any unit requiring repair to the BioSmart service center. BioSmart will perform all necessary repairs and return the unit to the customer. Shipping cost to and from the service center will be covered at customer’s expense. Any repair items not covered under the above warranty shall be billed to the customer. BioSmart will not be liable for any field service or labor costs or expenses related to the repair or replacement of any heater unit or part that is repaired in the field. All warranties implied by law, including the implied warranties of merchantability and fitness for a particular purpose, are expressly limited to the duration of the warranty set forth above. Some jurisdictions do not allow limitations on the length of the implied warranty, so the above limitation may not apply to you. In no event shall BioSmart be liable for any incidental or consequential damages, loss of profit, or medical expenses caused by any defect, failure, misuse, or malfunction of the product. Some jurisdictions do not allow the exclusion or limitation of incidental or consequential damages, so the above limitation or exclusion may not apply to you. The Company will not be responsible for the damages or losses, direct or indirect, caused by misuse, abuse, accident, negligence, conditions of transportation or storage, or failure to follow instructions or install its products correctly. The Company will not be responsible for any statements that are made or published by its dealers or representatives, written or oral, that are inconsistent with this written warranty, or which are misleading or inconsistent with the facts as published in the literature or specifications by the Company. You will be required to provide proof of purchase to BioSmart before receiving warranty parts or service. This warranty is invalid if the factory-applied serial number has been altered or removed from the product. You can call BioSmart directly for parts replacement per the warranty terms.